Monadnock Tales features an extraordinary, book length poem by Edie Clark. The combined work for chamber ensemble and narrator is a symphonic poem unique in the intricacy of its dialogue between words and music. This chamber version, narrated by Tom Putnam, is performed by a wonderful group of instrumentalists who have made it their own. 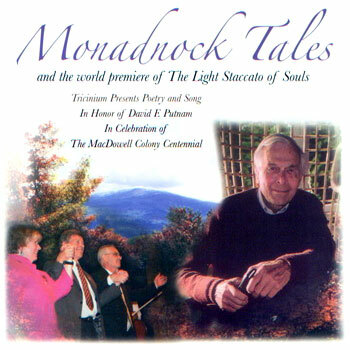 The Light Staccato of Souls was commissioned by Tom Putnam in memory of his father, David F. Putnam, a visionary and global citizen committed to his communities. Encompassing three winning entries from Tricinium's poetry contest on the theme of community, these songs emerged as love songs demonstrating the passion of people for the personal, local and everyday: our families, friends, partners, associates and neighbors. ...or buy from the following retail establishments: Toadstool Bookshops in Peterborough and Keene. 2. Who Was Playing the Piano at My Party Last Night?